(Chicago) — Illinois lawmakers weighed in on the significance of Senate Bill 3023, signed on Wednesday by Governor Bruce Rauner. The first state legislation to authorize a comprehensive array of pre-arrest diversion program approaches, it supports law enforcement officers in creating handoffs to community-based treatment when they see people who have overdosed or are showing other signs of substance use disorder. The legislation supports “deflection” of individuals with substance use problems away from the justice system and into addiction treatment services. Traditionally, law enforcement has been faced with two options: arrest or walk away. Deflection provides a third option: connecting people to treatment and/or other social supports. Chief sponsors Senator Melinda Bush (D-Grayslake), Senator Tim Bivins (R-Dixon) Representative Marcus C. Evans, Jr. (D-Chicago) and Representative Tom Demmer (R-Rochelle) spoke of its significance. The bill originated based on the successes of the Safe Passage program in Dixon and A Way Out in Lake County, Illinois. Leaders of the Safe Passage and A Way Out initiatives — Dixon City Manager and former Police Chief Danny Langloss and Police Chief Eric Guenther of Mundelein in Lake County, respectively — worked with TASC to spearhead the legislation. “This is a hopeful day for Illinois law enforcement and those suffering from substance use disorder,” said Langloss. “The national opioid epidemic continues to impact every community. More than 72,000 Americans lost their lives last year to drug overdose. Behind every death there is a family. With this bill, the police now have new programs at their disposal that save lives and make our communities safer. As police departments across the country began developing programs in response to the opioid crisis at an increasing pace, TASC’s Center for Health and Justice identified five overarching pathways by which law enforcement was diverting or “deflecting” people away from arrest and into treatment, housing, and social supports in the community. Building from this work, Jac Charlier, national director for justice initiatives at TASC, co-founded the Police, Treatment, and Community Collaborative (PTACC), a national alliance of practitioners in law enforcement, behavioral health, community, advocacy, research, and public policy working to strategically widen community behavioral health and social service options available through law enforcement diversion. 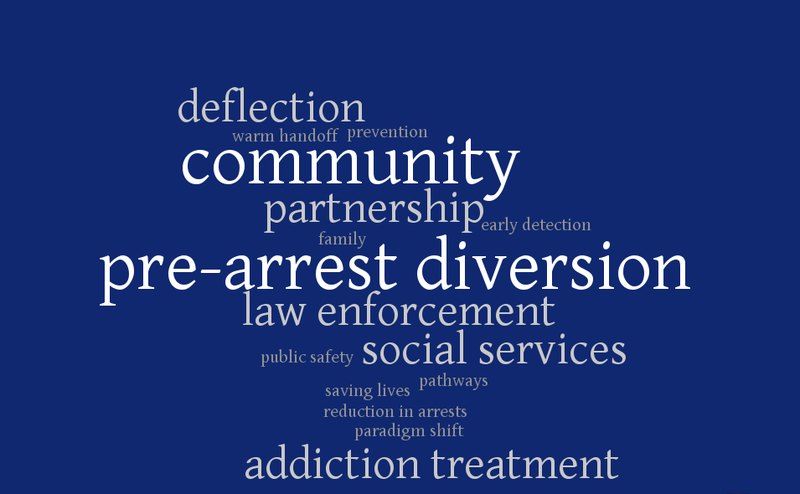 PTACC has illustrated these five pathways by which police departments are making connections to community-based treatment and social services; law enforcement and community partners can choose any or all of these pathways based on local needs and resources.